Half-day classroom, Online or Blended with 2 hour classroom skill practice session: Preview this workbook immediately! The ability to effectively solve problems is a tremendous asset for a manager. Although it would be nice, completely avoiding problems is impossible. Developing the skills to creatively solve problems and proactively anticipating future issues are invaluable to the success of your team. Solving problems often becomes difficult because the root cause is improperly defined or identified. In the rush to complete a project or meet the next deadline, people typically take action on the first solution that appears when multiple solutions are possible. Your ability to solve problems depends on your proficiency at addressing issues and problems as they arise as well as continually seeking improvement on existing methods and procedures. 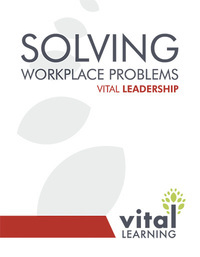 The Vital Learning Solving Workplace Problems™ course provides supervisors, team leaders, and managers with an effective approach, and the tools necessary, to improve current processes that organizations use to solve problems. Using structured activities, participants learn to identify the problem, uncover the cause, select the best solution, implement the solution, and determine what feedback and follow-up is necessary. 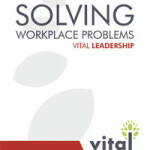 Click on the “e” to immediately enroll and begin the Solving Workplace Problems online course. Employees who complete this course are eligible to earn college credit toward an associate’s or bachelor’s degree through the University of Phoenix.